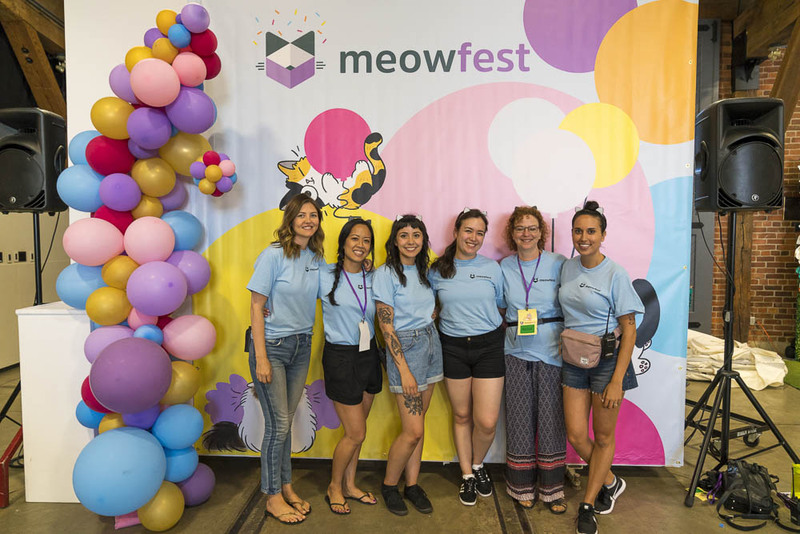 After months and months of meticulous planning in the meowbox office, our craziest kitty dreams finally came to life - meowfest became a reality on July 29th, 2018! We were able to raise over $10,000 in donations for the BCSPCA and other not-for-profit animal organisations (LAPS BC, New Westminster Animal Shelter, and Pet Education Project), and almost 20 kittens found their forever homes. We could not have had a more purrfect day surrounded by our fellow cat-loving humans and adorable feline friends! Why go to a cat festival if not to spoil yourself and your kitties with cat-related goodies? We could not get enough of our pawsome vendors and their unique cat and human products. From cat home decor, cat clothing, and cat art for the humans, to endless cat toys, accessories, and even cat wine for the kitties, there was something for everyone. Our first special event of the day was Hannah Shaw’s Kitten Rescue workshop. Also known as Kitten Lady (@kittenxlady), Hannah shared stories about her past foster kittens and her tips for kitten rescue and care. Next up was Andrew Marttila’s (@iamthecatphotographer) Pet Photography workshop, where Andrew shared his tricks for getting the perfect pet photo (his new book “Cats on Catnip” is a testament to his pawsome ability to catch kitties in their best moments). Mick and Klaus of Oskar and Klaus (@oskar_the_blind_cat) delivered a workshop on taking care of and advocating for cats with special needs. Our workshops ended with our Celebrity Cats Q&A panel, where our celebrity cat’s parents came together to talk about all things famous cat and Instagram related. The excitement was palpable in the Meet and Greet rooms, as people lined up to take a picture with alongside their favourite cats and humans. Pudge (@pudgethecat) started off the day, impressing everyone with her adorable moustache. Nala (@nalacat)and Luna Rose (@hello_luna_rose) were hard to miss in their pawsome space-esque backpack carriers. Klaus was content to people watch and hang out in his bacon bed. BenBen (@benbencatcat) was happy as can be, tottering around and accepting any attention and pets that came his way. The Meet and Greets wrapped up with a cheerful session with Hannah and Andrew, and even Cat Man (@catmanofwestoakland) stopped by! What’s a festival without food trucks? Vegan goodies at Rolling Cashew, tacos and burritos at Bandidas, and mac and cheese from Reel Mac and Cheese kept us fuelled for the day. Adorable cat-shaped cookies from Rain Bake Shop and vegan ice-cream treats from Say Hello Sweets definitely helped satisfy our sweet tooth. Now onto the most important part: the kitties! Our office foster kittens (the Ocean’s 8 kittens) joined us at meowfest in the New Westminster Cuddle Room, where they had a blast playing around all day. By the end of the day, many of the New Westminster kittens were pending adoption - they were just too cute to resist! One of the highlights of the LAPS Kitten Viewing room was the litter of tiny 5-week old kittens (with their human foster mom supervising nearby, of course). This precious little family was such an important reminder of the necessity of fostering. The older kittens in the room were just as adorable - and they were adoptable as well! Twelve of the LAPS kittens were adopted on site and left for their forever homes. We were so excited for the opportunity to unite so many cat lovers in one place - all while raising necessary funds for animal shelters and finding homes for adorable little kittens. We can’t have asked for a more meowvellous meowfest experience!